Educational Technology Guy: Buy a Livescribe SmartPen by April 30th, get 1 yr Evernote Premium free. Great deal. 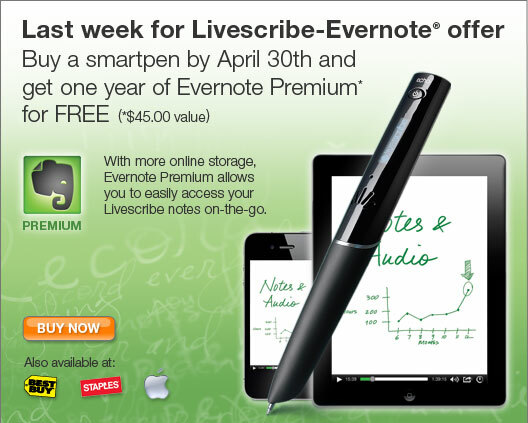 Buy a Livescribe SmartPen by April 30th, get 1 yr Evernote Premium free. Great deal. I'm a huge fan and user of Evernote. I'm a huge fan and user of Livescribe Pens. If you've thought of purchasing a Livescribe smartpen, and like Evernote, you should buy the smartpen before April 30th. If you do, you'll get one year of Evernote Premium free. I know this sounds like an advertisement, but I love a good deal, so I figured I'd pass it on to you.